Popularly known as "Palli-kobi" or Rural poet, Jasimuddin was born in an era when Rabindranath Tagore was the most popular versatile Bengali poet to dominate the entire world of Bangla literature with his incompatible and incomparable poetic brilliance. It was really hard to create an individual poetic identity, because most of the emerging poets firmly and passionately followed the footsteps of Tagore. Those who did not have their individual poetic diction were not poets, but imitators. Only a few poetic geniuses could remarkably compose poems which were not influenced by Tagore's works. Palli kabi Jasimuddin was one of the most important modern Bengali poets. He was and still is very famous for his unique way of writing Bengali poems focusing on the rural environment, people, relationship and culture of Bengal. This March 14 marks the 43rd death anniversary of the pastoral poet Jasimuddin. 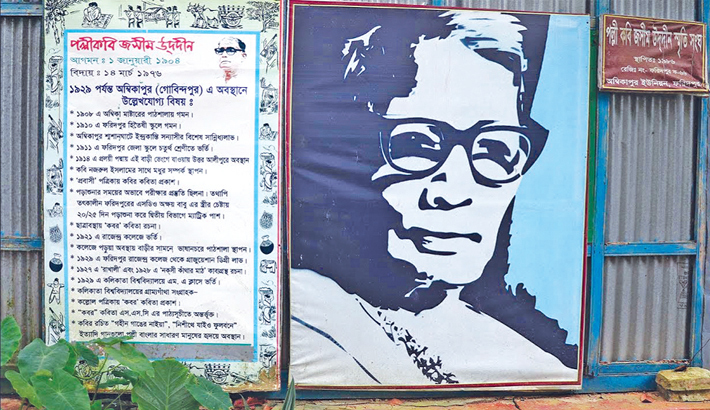 Poet Jasimuddin was born on a very suitable date of the year, 1 January 1903, in a village at Tambulkhana in Faridpur. He was the son of a teacher. He was born and brought up in rural Bangladesh. He received his higher education from Calcutta University where he worked as a research assistant under the surveillance of Dr. Dinesh Chandra Sen from 1931 to 1937. Then he came back to Bangladesh and joined Dhaka University in 1938. He worked there for 5 years. Later he joined the Department of Information and Broadcasting and became a radio personality. He worked with the radio until his retirement in 1962. Poet Jasimuddin started writing poems at a very early age. His poems are based on the people of rural Bangladesh. The form and content of his poetry carry a strong flavour of Bangladeshi folklore. Dr. Dinesh Chandra Sen once wrote, "His poetry appears like the breeze from the countryside that cools the sighs and sweat of urban living. He is congratulated for creating a new school of poetry". Today we are living a very urban life. The villages are turned into wastelands, because villagers are heading towards cities and towns for better facilities. For this reason, we may miss out something very interesting, important and beautiful about our villages and the various lives living there. So, a re-reading of Jasimuddin is a must to revisit rural Bangladesh through his poems. Poet Jasimuddin is widely known for his masterpiece Nakshi Kathar Math (Field of the Embroidered Quilt) which has been read, analysed and appreciated worldwide; and also translated in many languages. It is a lyrical ballad in which the poet depicted a beautiful tragic love story of a peasant boy, Rupai and his lover from the neighbouring village, Saju. Rupai and Saju are deeply in love with each other. They get married. They are living a happy life together until a quarrel among other peasants takes place. Rupai fights with other people and is forced to flee to other place. Saju, being a young beautiful wife, keeps on waiting for her beloved husband. But Rupai never returns. Her melancholy, sometime later, takes a creative way of getting expressed. She starts preparing a Nakshi Katha (an embroidered quilt) in which she depicts all her expectations, sorrows and sufferings. Before dying, Saju requests her mother to put the quilt on her grave. Her mother follows her words. Saju dies before seeing Rupai for one last time. In poet's word, "since then the field is known as Nakshi Kathar Math". Some days later, the villagers find a dead body holding the quilt tight on Saju's grave. It is no other than Rupai. The two melancholic and incomplete souls finally get together after their departure. Jasimuddin's way of composing the verse has turned this poem into an extraordinary masterpiece of Bangla literature. It is not only about a tragic love story of a rural couple but also about human nature. The poet wonderfully showed the beauty of rural Bengal. Poet Jasimuddin was an expert in characterising the "unimportant" rural people so importantly and beautifully. Although poetry is a form of fiction, Jasimuddin wrote about a real character named Asmani in his poem "Asmani". When he wrote it, Asmani was only 9 years old. No one knew Asmani in 1946. It is a poet's pen which introduced Asmani to the whole nation. This is why people became concerned with this real character. Asmani died in 2012. The news of her death took a place in a national daily. The poem has no story of bloodshed, wars and ammunition, yet it deals with human sorrows, suffering, struggle and hardship of living. The rural people usually have to struggle against natural calamities more. Asmani was a victim of such a cruel hunger at that time. She did not receive any relief. She suffered from poverty, illness, hunger and discomfort in every way possible. Jasimuddin's use of rhyme and rhythm lightly deal with the serious crisis of rural life through the depiction of the protagonist Asmani. Jasimuddin wrote his popular poem "Kabar" when he was a student. Now, the college students must read this poem to pass in the Bangla first paper exam, because this poem is included in their syllabus. This poem is a narrative of a grandfather to his grandchild. The heart touching narration makes the readers cry. The grandfather, grandchild and the readers shed tears at the same time. The poet beautifully created a momentum when everyone can exist at the same moment. A grandfather shows the graves of his wife and his children to his grandchild. Eventually we get to know that the grandchild has lost both his father and mother who are lying inside the graves just before his obscured pair of eyes. It is an unimaginable and unbearable pain to lose all the family members. I wonder, how a young student could write such a heart-melting poem from a grandfather's perspective! His choice of words and the way he composed the whole poem leave the readers stumped. A grandfather is an old man who always seeks attention of the people to share his stories. But people seldom hear him out. Poet Jasimuddin successfully voiced the poor old fellows who share the same kind of tragic events. Jasimuddin's another famous literary creation is Sojan Badiar Ghat in which he again depicted a love story between a Muslim man, Sojan and a Namasudra Hindu lady, Dulali. They are in love and get married. But the society is not ready to accept the marriage between people of two different religions. So, they think of eloping inside the forest. For some time, they live happily together. Unfortunately, Sojan gets caught and is imprisoned. Dulali is married off again by her orthodox parents to a farmer of the same caste living in a distant village. Sojan, after getting released from jail, finds out that his family no longer lives there and his beloved is remarried to another one. Then he becomes a gipsy in despair. While wandering around, Sojan finally finds out Dulali who is now happily married. Sojan goes to her, but she refuses his love. Dulali's refusal makes him take poison and kill himself out of the feeling of being unloved by his beloved. Dulali feels the love for Sojan again and runs towards him. She finds Sojan dead which leads her to take the poison and kills herself out of grief. Like Romeo and Juliet, Sojan and Dulali also give up their lives. The conservative norms of society take the lives of two love birds. If we look at the picture of the village, even now, we will see this Hindu-Muslim conflict for which many rural people are suffering, but have to remain hushed for being poor villagers. All his rural characters are from a certain group of people whose stories are almost always unheard. Their lives remain unnoticed. Their words are always unvoiced. Poet Jasimuddin wrote his poems and created his characters from a rural point of view which provided voice to the subaltern. The world got to know the stories and view the lives and lifestyle of rural people. The poet could stick to his own way of telling rural stories because of his profound love towards rural people and rural life. His poems, lyrical ballads and narratives express the weal and woe, happiness and sadness, gain and loss, expectation and hopelessness of everyday lives of the poor villagers. This is why, the necessity of reading the pastoral bard to revisit rural Bangladesh will never end. Which Shakespeare are you talking about?